According to Hattie (2009) direct teaching can play a major positive role in effecting student learning. Direct teaching is where ‘the teacher decides the learning intentions and success criteria, makes them transparent to the students, demonstrates by modelling, evaluates if they understand what they had been told by checking for understanding, and re-telling them what they had been told by tying it all together with closure’. Effective numeracy planning relies greatly on direct teaching. Carpenter (1989) proposes that conceiving teaching as problem solving is important for understanding teachers’ planning and classroom instruction. The focus here is for teachers to use knowledge from cognitive science to make instructional decisions. He refers to this approach as Cognitive guided instruction. It is based on the premise that the teaching learning process is too complex to specify in advance, and as a consequence teaching is essentially problem solving. Cognitive guided instruction was initially developed by researchers at University of Wisconsin in 1980’s. Fennema, Franke, Levi, Jacobs and Empson (1996) found that learning to understand students mathematical thinking could lead to fundamental changes in teachers beliefs and practices and that these changes, in turn, reflected in students’ learning. The studies provided sites for examining development of students’ thinking in situations where their intuitive strategies for problem solving were a focus for teacher reflection and discussion. This led to new perspectives on student thinking and on the instructional contexts that supported the development which led to the revision in the approach to teacher development. Carpenter et al (1999) refer to Cognitive guided instruction professional development as a program which engages teachers in learning about the development of students’ mathematical thinking with particular content domains. To understand student thinking teachers create their own ways of organising and framing knowledge as well as thinking carefully about relationships between this knowledge and their teaching. Essentially Cognitive guided instruction pedagogy focuses on what students know rather than on what teachers do. Cognitive guided instruction is consistent with independent learning and constructivist pedagogy. Dr Sam Jebeile (2008) conducted a study with commerce students where Cognitively guided instruction was used as a vehicle to improve student outcomes. The students were performing poorly in many of the numeracy based skills which were embedded in the commerce curriculum. Students completed a post test, with the results showing substantial improvements in student learning and final assessment results. Teachers identified areas for improvement in a specific topic. They created sample questions which were backward mapped from topics, tasks and assessments to identify the concepts which were potential problems. Students completed the questions as a pre-test. After marking, teachers interviewed students and asked them why they selected the strategies which led to the correct or incorrect answers. Themes emerged and the misconceptions were collated and presented to teachers in workshops. Once teachers understood where students were going wrong in their thinking, they took steps to address and highlight these areas in their teaching. Teaching and learning intentions were listed for each lesson which explicitly identified areas of common misconceptions, including the level of prior knowledge students bring to the classroom. Lessons were modified and adjusted to explicitly teach skills required to build new knowledge. Teachers observed each other’s lessons to ensure the misunderstandings were appropriately addressed, lessons were amended and activities were created to focus on the explicit teaching of the numeracy concepts. Students completed a post-test with the results showing substantial improvements in student learning and final exam scores. 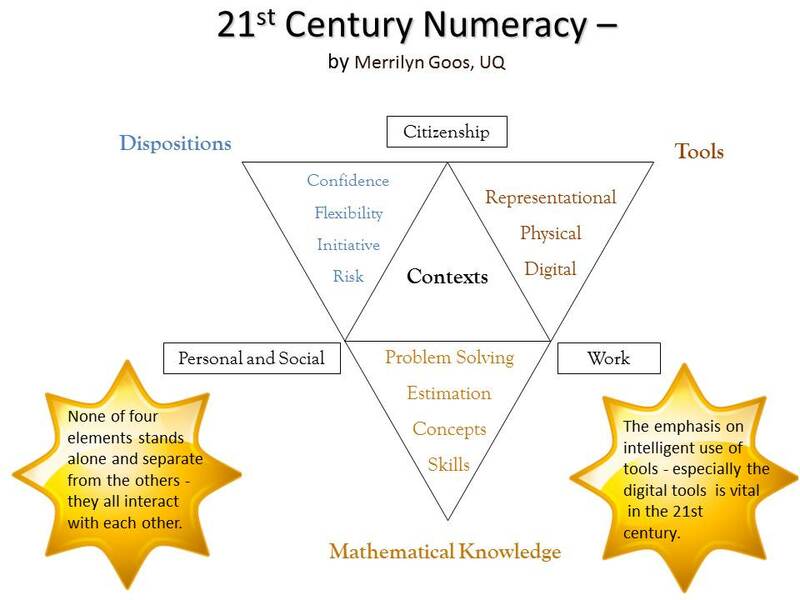 The 21st century numeracy model researched by Professor Merrilyn Goos represents the multi-faceted nature of numeracy that acknowledges the rapidly evolving areas of knowledge, work and technology. The model was created for teachers as a planning and reflection tool. It contains five main elements. Mathematical concepts and skills; problem solving strategies; estimation capacities. Capacity to use mathematical knowledge in a range of contexts, both within schools and beyond school settings. Confidence and willingness to use mathematical approaches to engage with life-related tasks; preparedness to make flexible and adaptive use of mathematical knowledge. Use of material (models, measuring instruments), representational (symbol systems, graphs, maps, diagrams, drawings, tables, ready reckoners) and digital (computers, software, calculators, internet) tools to mediate and shape thinking. Use of mathematical information to make decisions and judgments; reason and support arguments. In Professor Goos’ study, teachers were asked to use the 21st century numeracy model (see below) to support improvement in numeracy teaching. In the research a physical education teacher used the model to adapt and modify an existing lesson. In the adapted lesson you can see the range of mathematical knowledge dealt with such as number, ratio, converting units of measurement and representing and displaying data. Students related physical education concepts to their personal life, making for a rich and meaningful platform for deepening students’ understanding. Students used physical tools such as pedometers and measuring tapes and digital tools such as Excel spreadsheets and data displays. The teacher explicitly addressed numeracy dispositions by encouraging students to estimate, compare, reason and make sense of the magnitude of the distance. Students used mathematical tools and technology to collate and display data, and were able to explain results which appeared on graphs when comparing charts. Some students chose inappropriate graphs to display data which led them to identify better ways for data representation. Students complete the activity in their books. Students create data displays using Excel and also Excel formulas to calculate the total number of kilometres for each student for the week.